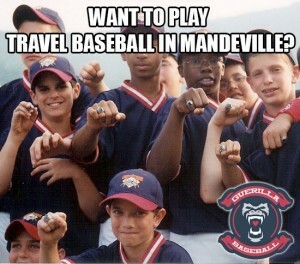 Want play travel baseball in Mandeville? Guerilla Baseball Academy in Mandeville, Louisiana is host of the Knights Travel Baseball Organization. This is one of the top travel baseball organizations in the Louisiana area. Guerilla Baseball Academy also runs lower level teams for the Knights organization. If you are interested in playing travel baseball please contact us or come by our facility just next door to KMart! If you would like more information on travel baseball in the area then please continue to read this article. It will cover travel baseball verses recreational baseball, what travel baseball requires of the player and parent, ball park pricing and the pros and cons of travel baseball. There is a big difference between the two. Rec Ball today has become an equal opportunity sport for young kids who want to play but NOT experience much of the failure of the game. Travel Baseball has evolved because of this major change to a “failure free” rec baseball program. Travel baseball isn’t for every young kid because it will subject the player to the ups and downs of the game but mainly the downs because baseball is a game of failure. For example, his time on the field is usually the product of his ability to play the game. If the player is struggeling to compete at the current travel ball level then this will be very challenging to his young ego. Time is a big factor of travel baseball. You will be practicing once to twice a week or more. Plus you will be spending an entire weekend participating in a 3-6 game tournament. If the player is struggeling on the field many parents also put their child in training programs or private lessons. This means more time devoted to travel baseball. Most parents after a good summer travel ball season experience “burnout.” Be very prepared with the time that travel baseball requires of a family. You need to have a basic level of skills before playing travel baseball. Most coaches and organzations expect their players to already be performing at a certain level of play. Developing players for the weekend tournaments is usually not the focus of the team. Practice during a travel baseball season is more for tweaking and adding reps to an already developed skill. You will be disappointed if you expect your travel team to develop the player if he does not have a base level of skill. This is why a baseball academy like Guerilla is needed. All teams are different but the ballpark for travel baseball is around $150-$250 per month. This includes all uniforms, tournament fees and practice expenses. This can be a good investment for a parent especially if they are paying for extra training for their child. When the player reaches the 14-16 age range teams are harder to find and harder to play for. It is the pyramid model as you see here to the right. 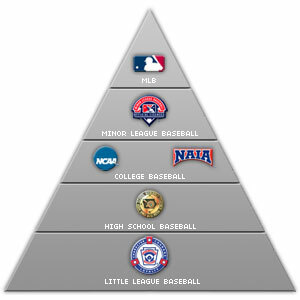 From little league to high school baseball there is less room for opportunity which becomes less and less as the player ages or advances up the pyramid. Travel baseball definitely isn’t for every family. Here is a list of the pros and cons for travel baseball. If you are still interested in playing travel baseball in the Mandeville. Covington, Slidell or Hammond area then I would highly recommend that you contact Guerilla Baseball Academy. You have the option of joining one of our travel teams based on your child’s age and level of play. Looking for 2015 8U or 9U travel team to try out for. Is registration or walk-on available. My son is a pitcher and played third base. Looking for a 14u travel team for my son. He’s a catcher and has played short stop and pitches.